A prickly 2D Metroidvania with a curious twist. What is it? A 2D platformer with no running and jumping – but rather, warping. The opening hours of Dandara are a hard sell. 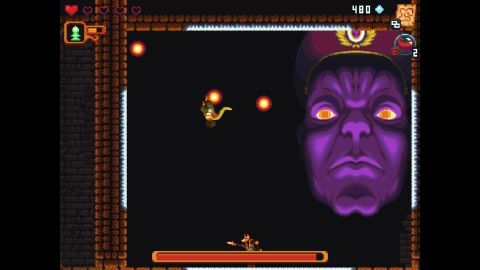 This is a 2D platformer, except you can’t jump, and for that matter, you can’t walk or run. Instead, the protagonist (whose name is Dandara, by the way) must warp between white surfaces in order to traverse the world. She can do so quickly and sometimes gracefully, but rare is the time you’re not thinking: isn’t there a better way? And it doesn’t help that this world resembles one secured in a jar and shaken violently. Borrowing the familiar branching structure of a Metroid, Dandara also inherits Dark Souls’ levelling system. Killing enemies reaps you salt, which is used to upgrade your health and other abilities at the rare and always welcome campfire spawn points. Die, and you’ll lose your salt, unless you can get back to the glowing corpse you leave upon your death. New abilities unlock at key story beats, and usually help you traverse the world: Jonny B Missiles double as a powerful weapon and a way to break through rock walls, while the Stone of Creation lets you warp further than normal at specific points—and these are just the first two. Aside from the traversal, the game world itself is remarkable. It’s as illogical and winding as an Escher drawing, except rendered on a 2D plane. Any of the four sides of a given screen or environment could very well be a roof, or a floor, or a wall—or none of these things. When the protagonist warps from one white surface to another, the camera often re-orients: you’re meant to feel dizzy, poorly oriented, confused. Coupled with the lush orchestral soundtrack and the mysterious, austere art design, Dandara has a unique atmosphere, feeling more like an artifact you’d unearth, rather than a digital product purchased on Steam. But it has a lot working against it. The skewed world design is a cool concept, except that you’ll absolutely need to use the world map to figure out where you haven’t been. And while that map is static in its orientation, the world itself is ever-shifting, resulting in a game that sometimes graduates from “brain teaser” to “annoying”. It doesn’t help that some puzzles revolve around correct traversal through the labyrinthine world, and if negotiated incorrectly, a whole lot of backtracking is required. A more detailed map— perhaps one that named the different world areas—might mitigate this frustration. But even once you’ve overcome this quirk (and you will, if you’ve got the patience), Dandara is still an awkward beast—original in an admirable way, yes. But annoying… also yes. Modern 2D games must always have a twist, and I think Dandara’s warp traversal twist isn’t quite as appealing as it needs to be. After hours of play, I still missed the simple ability to walk—warping always felt slightly cumbersome, especially during combat. It’s all good if you’re facing off against one or two foes, but when you’re firing your slow-to-shoot projectiles at a handful of foes, while trying to accurately warp between safe areas, it can feel annoying and far from precise. Dandara was designed to feel just as great on a touch screen as a PC desktop, and while you’ll rarely find a Metroidvania this rewarding and complex on a phone, there’s no lack of games in this mold available for PC (you’ll absolutely need a controller for Dandara, by the way: do not try to play it on a keyboard). The world of Dandara is filled with forests, futuristic cities and sprawling interiors (among others), and while varied enough thematically, it’s still too easy to get lost in. Exploration is fun for a while, but each area’s map sprawls in such a way that it can be exhausting to backtrack from one side of the map to the other, a feeling compounded by the scarcity of new spawn points. Shortcuts are unlockable and the maps do blossom in interesting ways thanks to new powers, but overall, a lot of this game’s charm will only be discoverable by those with a huge reserve of patience. But I maintain a begrudging respect for Dandara. I’ve not played a game that nailed quite this specific atmosphere, and the art and music is gorgeous. I’ve no doubt it will find its niche of determined players, and I hope it does: Brazilian studio Long Hat House has created a game that feels, in some ways, unique. But it’s tough in a way that can feel punishing. If Dandara’s traversal felt better, if its combat felt better, the constant backtracking wouldn’t really matter. But too often I just wanted to go for a walk instead.